Thermal Energy Storage is a technology commonly used in District Energy Systems due to its multiple benefits. The main benefit is the reduction of the District Energy Plant, as the capacity of the plant will be selected as per the average demand, not as per the peak demand. Another advantage is the efficiency increase. In district cooling plants with TES Tank, an important part of the cooling energy is produced at night when ambient temperature is lower and chiller efficiency is higher. How does the Naturally Stratified Water Storage Tank work? The operation of the tank is simple. Both chilled and warm water are stored in the tank thanks to the naturally stratified technology. When there is an excess of production of chilled water coming from the chillers, this is stored as cold water in the tank. As a result, when there is a lack of chilled water supply, or in other words, when the consumption is higher than the chiller capacity, chilled water can be obtained from the tank and used to cover peak-demand hours. The charging period: during this phase, pumps take the warm water from the upper side of the tank and send it to the chillers. Part of the cold water generated goes to the lower part of the tank while the other part goes to supply the consumption, taking advantage of the full capacity of the chillers. This phase usually coincides with night-time when consumption is low. The discharging period: in this phase, the consumption pumps take the water from the lower part of the tank and send it to satisfy the customers’ demand. In this period warm water goes to the upper part of the tank. This phase often coincides with midday and afternoon when the demand is high. What does the European Union’s energy policy say or intend? One of the objectives of the European Union’s Energy Policy is to develop the efficiency of energy production as we currently understand it. District Cooling plays a significant role today in the responsible use of energy, and intends to further contribute. In this context, using a Thermal Energy Storage Tank, or specifically a Naturally Stratified Water Storage Tank for District Cooling entails significant benefits and will enable to “do more with less”, ensuring that District Cooling will further contribute to the goals of the European Energy Policy. The overall cost of the installation is lower due to the reduction of the refrigeration plant installed capacity. The refrigeration equipment size is smaller because it is designed for average loads and not for peaks. The operational cost is reduced in comparison with an online cooling system because peak consumption can be avoided during high electrical tariff periods. The environmental impact is reduced because of the reduction of CO₂ Storing the energy and improving operating efficiency with the thermal energy storage tank helps to reduce even more the CO₂ emissions of a district cooling system. The plant dimension of the refrigeration system could be reduced. This is given by the fact that the refrigeration capacity of energy to be produced by the plant will be lower due to the energy already accumulated in the tank. Therefore, a smaller refrigeration system can be used. 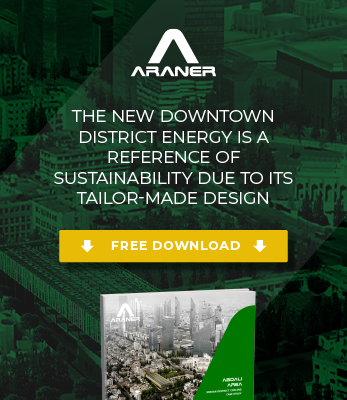 ARANER’s Thermal Energy Storage solutions are tailor-made by a team committed to aim for and accept challenges that bring value in any of the fields in which we are present. When it comes to TES solutions, we make sure that the final result suits customer’s demands, providing not only the diffusers design, but also manufacturing, supervision during installation and commissioning giving full support to our customers from the earliest stage up until the finished product is handed over.